What takes top billing at a gastropub, the drinks or the food? 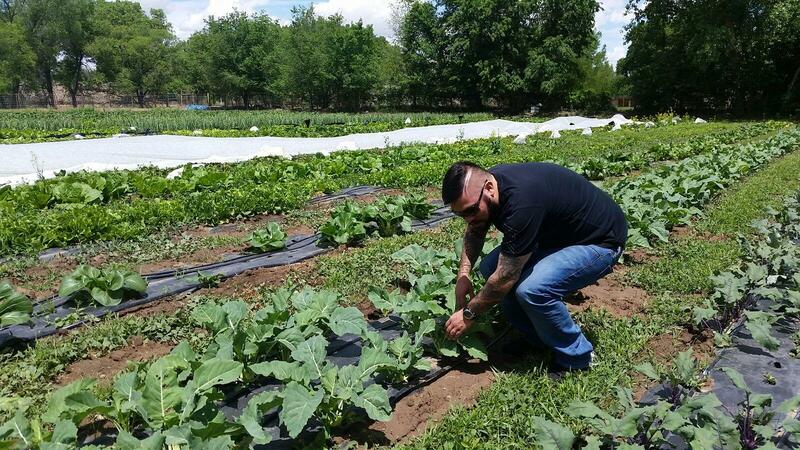 At Soul and Vine Restaurant in Albuquerque, a creative chef and the use of local farm fresh ingredients help give the upper hand to food. “The cuisine is fusion American bistro, a mixture of gastropub classics, but elevated,” says executive chef David Ruiz. Gastropubs are part wine bar, part beer pub and part upscale restaurant. You could think of a gastropub as a combination between a French bistro and a British pub. They also tend to have a casual yet elegant atmosphere. Soul and Vine fits the bill. Walking into the Gold and Second Street Downtown establishment near the Alvarado Transportation Center, the space feels clean and modern. High ceilings, white Italian lights and well-spaced booths and tables are dressed with white linens. The bar has a sleek black top, pendant lighting and several tables adjacent to the large street side windows. Daily happy hour specials are available to complement a good selection on the appetizer menu. Ruiz enjoys using locally grown fresh food as much as possible. Raised in the Bay area, he says the local food movement was already lively by the time he was growing up. He also has fond memories of summers spent on his grandmother’s farm in Gilroy, Calif., eating fresh vegetables and helping her farm. 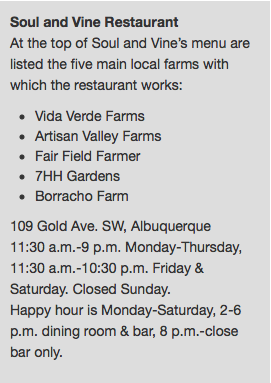 At the top of its menu, Soul and Vine lists five main local farms it works with: Vida Verde Farms, Artisan Valley Farms, Fair Field Farmer, 7HH Gardens and Borracho Farm. Ruiz connected with three of these farms when a group of farmers came in for dinner one night: Seth Matlick of Vida Verde, Dan Schuster of Fair Field Farmer and Alan Osgood of Borracho Farm. After that, Ruiz went to visit their farms, and relationships were formed. 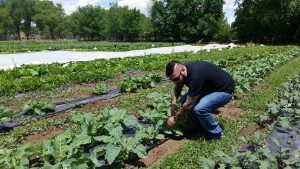 This time of year, customers enjoy squash, tomatoes, salad mix, spring onions, heirloom carrots, baby zucchini, baby fennel, broccoli, cabbage, cantaloupes, melons and more from these farms. Soul and Vine also has a mini-garden just a block away in the outdoor atrium of a friend’s Downtown business where they grow greens (when it’s not too hot), herbs, tomatoes, eggplant, edible flowers and peppers. To top it off, additional fare such as cucumbers, squash and fennel come from the garden of their general manager. One ingredient that Ruiz says he particularly enjoys purchasing locally is chicken. “The birds are 100 percent organic and they have a delicate, smaller breast,” he explains. They also purchase New Mexico-raised beef and milk. Most chefs who embrace a seasonal food concept change their menus frequently, and so too does Ruiz. In addition to daily creations to accommodate small-batch purchases, his regular menu changes every two months. “I really enjoy coming out and talking to the guests. I care what they think. It’s not just money that we want. We want to make people happy,” says Ruiz. Ruiz’s style in the kitchen seems to be equally tuned in to creating a happy atmosphere among his staff. “I’m like a player’s coach. I give them vision and I don’t hold them back. There’s no yelling like Gordon Ramsey,” quips Ruiz referring to the international star chef known for screaming in the kitchen. 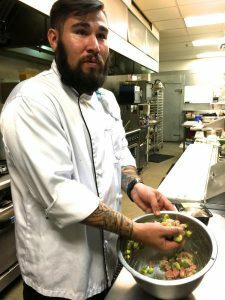 Educated at the California Culinary Academy, Ruiz came Albuquerque to take the position of executive chef at the Hyatt Regency Tamaya Resort and Spa. It was at Tamaya that Ruiz met Tony Punya, whose family owns Soul and Vine, among other Albuquerque restaurants such as Sushi King. Punya liked Ruiz’s style of cooking, and so they hatched a plan to work together. Punya says that he grew up in the restaurant business in California, and when his mother came to Albuquerque in 2000 and he and his brother followed in 2004, they continued doing what they knew best. “My parents have always owned restaurants. I started by washing dishes, being the cashier, and doing a bit of everything. My mom still washes dishes sometimes if a dishwasher needs some days off,” says Punya. Soul and Vine is casual fine dining. “You don’t need to wear a suit. We get everyone from University of New Mexico kids on their first date to business meetings. You come for the experience,” says Punya. Dinner entrees include dishes such as squash ravioli with wilted greens, brown butter piñon sauce and lemon curls, or buttermilk chicken and gravy with garlic spinach and sweet potato chips. Recently nominated for Chef of the Year from the New Mexico Restaurant Association, Ruiz says he owes his success to his staff. In mid-September, Ruiz and his crew will see how the competition turns out. “It’s an experience you haven’t had – colorful, bright foods with a focus on plating and taste. That’s what sets our food apart,” says Ruiz. 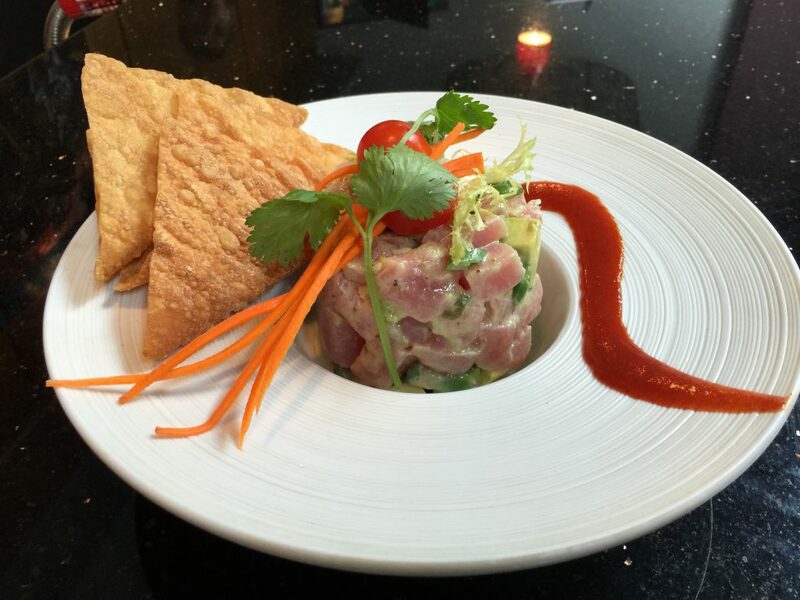 Soul and Vine’s Tuna Tar-Tar Tacos start with sushi-grade Ahi tuna, then layer in farm-fresh avocado and green onions. Toss tuna, avocado, green onions with about 1.5 ounces of the dressing. Use the rest of the ingredients for garnish. Dress the beets in oil with salt and pepper, foil wrap, and heat in the oven at 350 for 45-60 minutes. When finished, cool in the refrigerator, then cut into 1-inch cubes and set aside. Combine all ingredients in food processor and blend on medium power. Slowly add 3 cups of oil until all ingredients and oil are emulsified. This will produce a little more than you need for the salad, so store it in the refrigerator for use later. Add salt and pepper to taste. Combine all salad ingredients in a large mixing bowl (except cheese) and toss with the appropriate amount of Grapefruit Vinaigrette. Top with crumbled gorgonzola. Add grilled chicken prawns or portabella mushrooms for a heartier version. COOK’S NOTE: Bursting with flavor, try serving this delicious salad with grilled chicken, prawns or portabella mushrooms for an even heartier meal. Cut the parsnip lengthwise into slices slightly thinner than a coin. Place the slices in a bowl of water. Repeat for the potato, celery root and beet, placing the slices of each vegetable into separate bowls of water. Set aside to soak, about 20 minutes, to remove the excess starch. In a large, heavy fry pan over medium-high heat, pour in sunflower oil to a depth of 4 inches and heat to 375 degrees on a deep-frying thermometer. Drain the vegetable slices and thoroughly pat dry. Carefully place a handful of parsnip slices in the hot oil and fry until golden and crisp, about 3 minutes. Using a slotted spoon, transfer to a wire rack lined with paper towels to drain. When the oil returns to 375 degrees, fry the remaining parsnip slices. Fry the potato slices, then the celery root slices and finally the beet slices in the same way, letting the oil return to 375 degrees before adding each batch to the pan. The potato slices will cook in 3 minutes; the celery root and beet slices will cook in 4 minutes and will crinkle slightly and will not become crisp until they begin to cool. Place the crisps in a bowl and season with salt. Serve immediately. COOK’S NOTE: Most London pubs sell packets of crisps or nuts, but stylish bars serve their own vegetable crisps, bread sticks and marinated olives. The crisps are made from finely sliced root vegetables, such as potatoes, parsnips and celery root, and are tossed in sea salt. Some are flavored with a dusting of chile powder or chopped fresh thyme.